The smell of a pines forest has always been a little magical to me. I expect this can be readily explained away as some childhood association with Christmas. After all, I was born in mid-November and smelled my first pine tree a month or so later when the family Christmas tree went up. Pine/Christmas trees certainly have strong associations with nice things for me. Whatever the reason, I cannot gainsay the fairy tale and magic association that comes along with the scent of pine. So when I learned that Ese’s Weekly Shoot & Quote Challenge was “Scent” my mind went to pine trees. I couldn’t decide between two quotes so I hope you enjoy the photo and quotes and I hope that you will forgive me for my dual submissions. The first quote is more directly applicable to the challenge, but I liked the optimism in the second quote and I’m convinced that it likely would have been about pine scent if only Mr. Douglass had been standing in a pine forest when he wrote it:). 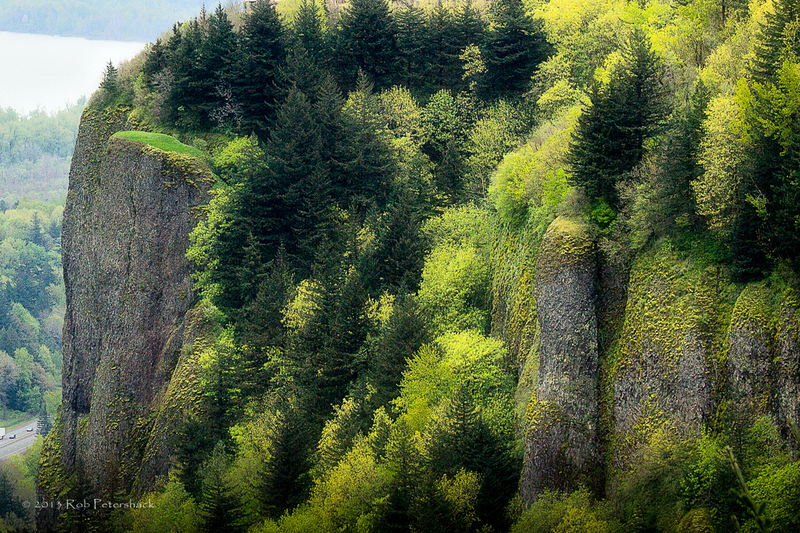 The photo is of Crown Point on the Columbia River in Oregon. I love this photo, but I want to tell you that Great Blue Herons are not actually this blue. That said, the heron looks this blue in the RAW file from which this photo comes. I believe the unusual color here is due to the sunlight which has been filtered through the tree cover. 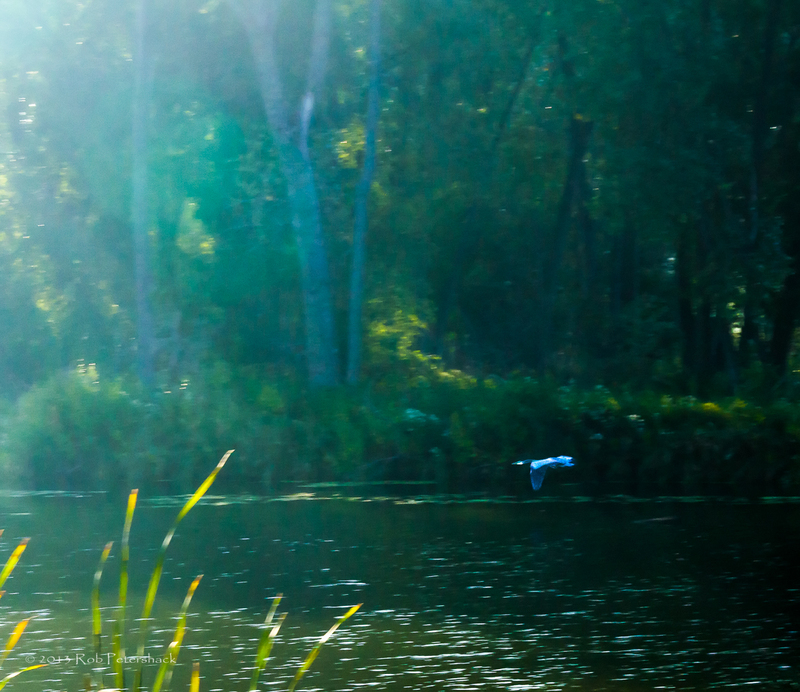 I know the highly unusual supercharged blue of the heron is a small piece of the photo and I could have made it larger, but then I would have lost the ambience and explanation for the color. I took this photo recently in Madison’s Warner Park. This photo, incidentally, is of the hidden side of Warner Park. The park is generally seen as a multi-purpose recreational park (home to the Madison Mallards [a summer collegiate baseball team], numerous softball fields, a large community recreation center, big parking lots, etc.). I doubt that most people think there is any wildlife besides a few ducks in the park. I hope you enjoy this submission for the Weekly Photo Challenge – Saturated. The challenge for this week’s Weekly Photo Challenge is “Saturated.” As you can see, I chose the single color route and went with red, a color with which I often have problems. My intention was originally to take a photo of a red flower in a bed of red flowers outside of the Wisconsin State Capitol using depth of field to highlight the individual flower. 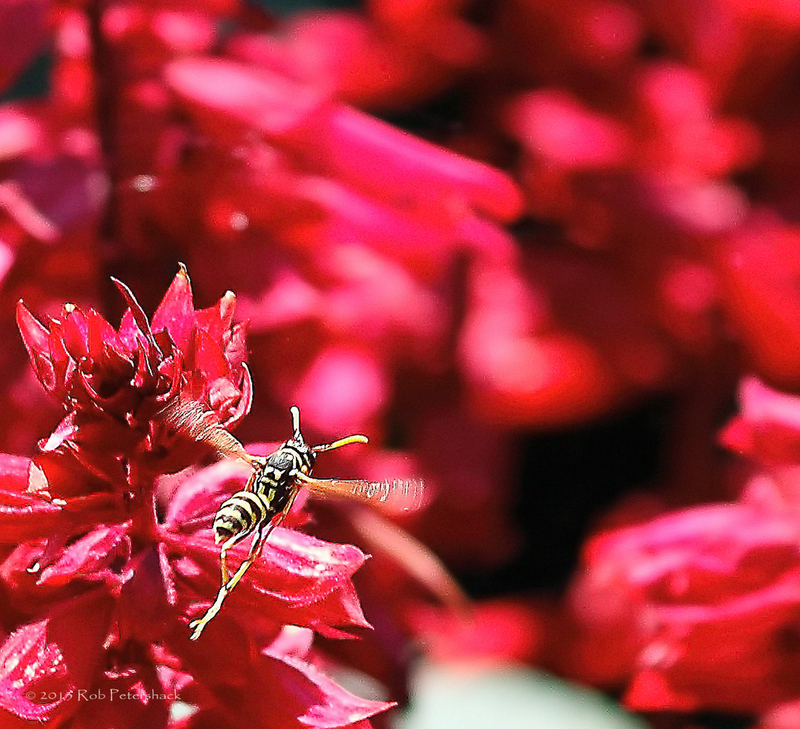 However, the “star” of the photo is the wasp which I captured in flight next to my target flower. The shallow depth of field intended to make the single flower stand out from the identically colored flowers in the background makes this a pretty lucky shot and not one I was planning until the wasp happened to fly by. 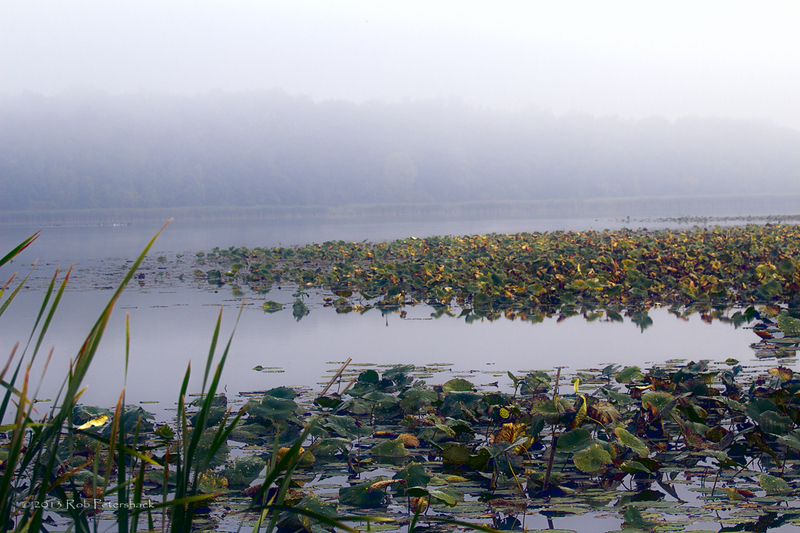 Here is my entry this week for the “Photo Friday Challenge – Nature Walk.” Entries must be published separately as a permanent page per the contest rules, which means they don’t show up as a post unless I post the entry again here. My entry is a little spooky, but I think it meets the challenge theme. Let me know what you think. 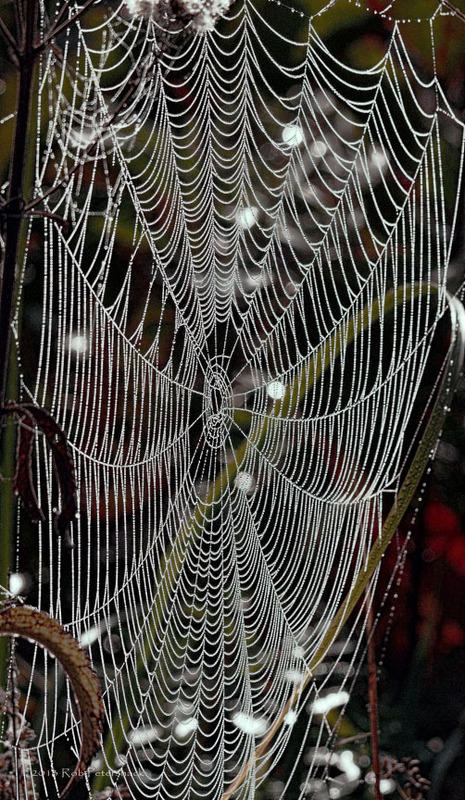 This may not be what most people consider a nature walk, but what walk could be more natural than a spider web? This is a wonderful shot of a magnificent place that I wasn’t aware of at all. Located in Misiones Province in the Northeastern tip of Argentina and bordering the Brazilian state of Parana to the north, Iguazú National Park, jointly with its sister park Iguaçu in Brazil, is among the world’s visually and acoustically most stunning natural sites for its massive waterfalls. It was inscribed on the World Heritage List in 1984. Across a width of almost three kilometres the Iguazú or Iguaçu River, drops vertically some 80 meters in a series of cataracts. The river, aptly named after the indigenous term for “great water” forms a large bend in the shape of a horseshoe in the heart of the two parks and constitutes the international border between Argentina and Brazil before it flows into the mighty Parana River less than 25 kilometres downriver from the park. These are the facts: We have here the very innocent Ms. Hollyhock who has inexplicably exploded into waves of vibrant color. 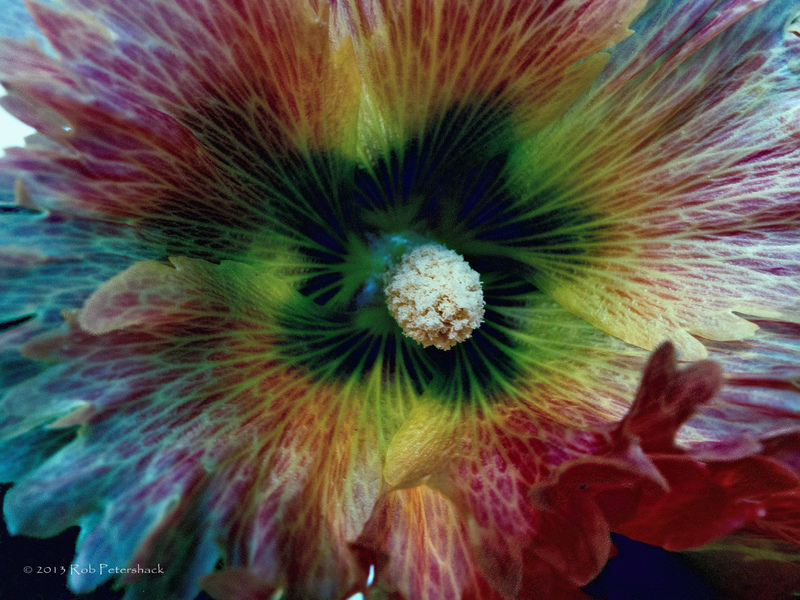 Being a flower, Ms. Hollyhock cannot explain what happened. If you have any thought or comments on this matter, please leave a message in the comment section below. Seriously, I have been taking a lot of flower photos lately and have simultaneously been experimenting with Topaz’s ReStyle. What you see is one of the results. By the way, I am getting a greater appreciation for headline writers who strive to say something appropriately attention grabbing so that readers of newspapers or website or blogs will check out the story (or here, a photo). I have the great advantage of not have to stick to any actual facts, which I imagine would make the whole process much more difficult. I am trying to develop a quality of what Stephen Colbert has called “Truthiness” in order to jump-start my efforts (big smile).